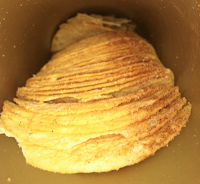 My loving big sister spied some intriguing flavors of Pringles Potato Crisps over the holidays, so of course she scooped them up for me. Wow. Looking at the flavors, I'm not sure if she's trying help me with the blog - or if she's mad at me. The first flavor we tried was the Cinnamon & Sugar. The Bride liked them but said they were simply Pringles with cinnamon sugar in them. Advertising on the nose, I guess. Especially when you consider they are Cinnamon & Sugar Flavored. I tried one very tentatively, as I am sometimes allergic to cinnamon, usually the aroma more than ingesting it. I was feeling funky before I ate the crisp, it was definitely getting to me, only 'Flavored' or not. 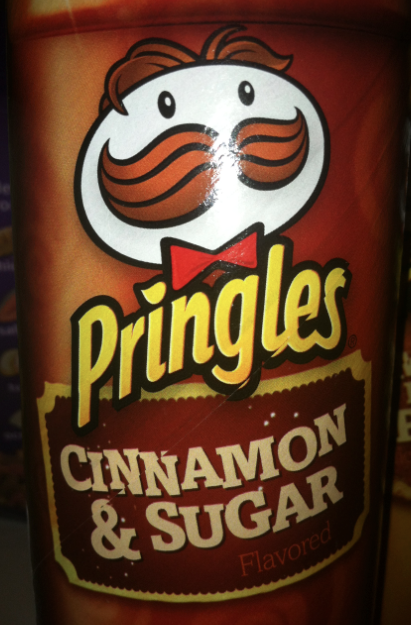 The Bride was right on target, just a Pringles crisp with baker's cinnamon sugar on it. A bit too much for me though. Good thing The Bride likes them. 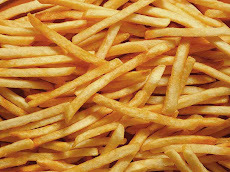 The Potato That Slices You!